If you have a green thumb, you probably know that when gardening season ends it can be difficult to find room to store all of your equipment. Perhaps your gardening gear might fit in your garage, but it will be a tight fit when you want to park your car during the winter months. Some items can be left outside over winter, but often that is less than ideal. Affordable Family Storage in Des Moines has simple solutions for storing all of your gardening and lawn care items. Read on for helpful tips and resources for gardening storage. Heat and humidity are the arch enemies of gardeners who store seeds and bulbs. Make sure to store your seeds and bulbs in a cool, dry place. Always use airtight containers for seeds, mason jars or rinsed spice containers are a great choice. Before storing your seeds, ensure they are completely dry and free of any dirt and debris. A climate-controlled storage unit from Affordable Family Storage is a perfect choice for preserving your prized seed collection during the winter months. Our climate-controlled facilities manage temperature, humidity and air quality, so you can rest assured that your stored seeds will sprout strong in the spring. Gardening hoses may seem pretty resilient, but if they are left outside during winter in freezing temperatures they can become damaged very quickly. 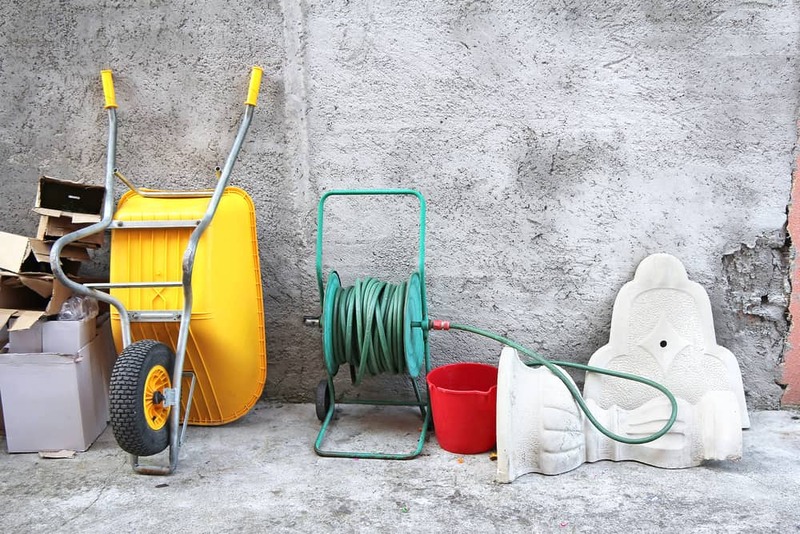 Always make sure to drain all of the water from your gardening hoses before storage over the winter. Residual water can freeze and cause ruptures in the hose. Damp and debris on or around the metal fittings on the hose can cause rust damage to the threads on the fittings, resulting in a leaky hose when spring rolls around. It can be difficult to find space for storing your larger equipment for gardening. Everything from shovels to wheelbarrows will have to find a home in storage over the winter. Metal tools such as shovels and rakes should be wiped clean and oiled before storage to prevent rust damage. Wheelbarrows should be rinsed out and dried before storage. It can be difficult to find space at home, consider a storage unit from Affordable Family Storage. We can provide a storage unit in whatever size suits your needs. Try out our Storage Space Calculator to select the size that will be perfect for you. The first step is easy: operate your equipment until all the fuel is used up and the engine stalls out. Give the starter a few extra pulls to be sure that the engine is completely free of fuel. Clean or replace the air filter and the fuel filter on your equipment before storage. Remove any grass, soil or other debris from all surfaces on the equipment. Clean and oil any edged tool faces on your equipment, including lawnmower blades and the tines on roto-tillers. Apply grease to joints, hinges and bearings. Store your equipment on top of a tarp or otherwise elevated from the ground. This will ensure dry storage and prevent rust. Cover your equipment with heavy canvas or a plastic tarp. Affordable Family Storage offers climate-controlled storage units to provide the best protection for everything in your garden. From seeds to lawnmowers, climate-controlled storage is the best option for preserving your equipment. When warm weather comes back around, your gardening equipment will be ready for you. Contact us today to find out how we can help your garden grow!